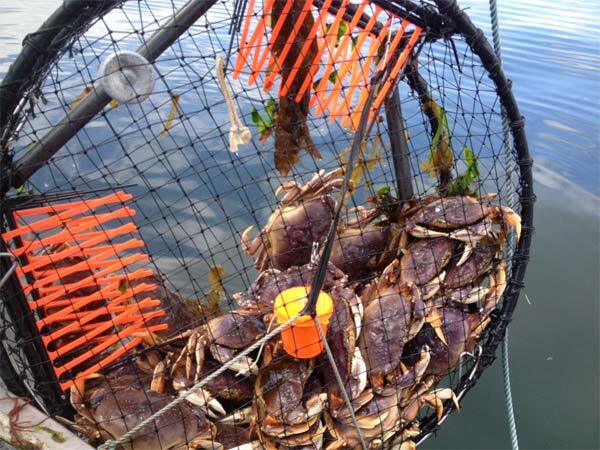 Over the past 4 months, a commercial Dungeness crab fisherman on the outer coast of Vancouver Island has been testing various Neptune Dungeness triggers in his existing round pots. He tested 3 various models to see which would work the best. His existing pots had rigid tunnels and he was cautious about cutting them out to mount the Neptune triggers. Initially he rigged 5 pots, then 10, followed by 20 pots. Over this time he gradually picked out one trigger that stood out from the rest. The MFL 105 trigger made with a finger tip gap of around 1″ proved to be the best design. He mentioned to Capt. Neptune that it became evident that the Neptune modified pots were out fishing his remaining conventional pots by 20% at a minimum. He has since modified all his pots with the MFL 105 triggers and is quite happy with the results. Another tidbit of information passed on to the Capt. by this fishermen is worth passing along as well. The fellow mentioned that in the winter they are only allowed to fish a diminished number of pots (67 pots) and can only haul their pots once a week. The fisherman’s son was crewing for him and one of his jobs was to bait the pot. On their weekly haul of the gear, one pot with Neptune triggers comes up with no bait container. His son forgot to bait the pot. The result……8 crab in an unbaited pot! The fisherman asked Capt. Neptune if he thought it might have had something to do with the orange color of the Neptune triggers? The Captain’s response was that it very well could have been. Why would this be the case? When we mold our finger units with orange polypropylene, we add a fluorescent pigment to the mix. This is thought to create a residual ‘glow’ that might be able to be picked up by crab and other shellfish’s eyes even though it just might just appear bright to human eyes. One of the other things that became evident in this winter fishery in BC was the holding capability of Neptune rigged pots. Dungeness crab are known to be escape minded once the bait is gone after a couple of days. The traditional SS triggers have problems at times ‘leaking’ crab on longer soaks. Evidently, there was very little leaking in the Neptune pots when they could only be hauled once per week. In the deep water Golden king crab fishery in the Aleutian Islands, the only color of trigger used is our orange triggers. The same goes for the Chaceon Golden crab fishery in Florida. The Capt. has also heard from spiny lobster fishermen in New Zealand concerning the orange colored fingers. Some fishermen would fish black and orange fingers in separate pots to check out results. The results came back with the orange triggered pots out-fishing the pots with black triggers. Same thinking as crab fishermen in the US and Canada…there’s something fishy about Neptune’s orange fingers! A commercial Dungeness crabber fishing South Puget Sound has been the first to fish a new 3 entry pot featuring Neptune Triggers. Using Neptune MFL 105 triggers and Spectra webbing, Dungeness Gear Works (DGW) in Everett, WA, made the pot shown below. The third trigger is covered with crab but it’s there! We are working to create a square Dungeness crab pot that would have Neptune triggers on 3 sides of the pot. The pot’s bridle would be opposite the flat side of the trap. This would keep the triggers from getting impacted by the crab when the pot is hauled. Stay tuned ! This entry was posted in Fishing News on 06/24/2013 by admin.